Welcome To NaijasilverEntertainment blog: Sponsored: Britain’s got talent winner "Ike Chuks", releases new single "Man Down"
Sponsored: Britain’s got talent winner "Ike Chuks", releases new single "Man Down"
From winning Britain’s Got Talent as a member of diversity to debuting with “Play Like Play”, which served as his first official afrobeats single; Ike Chuks has been rising fast on the world music scene. It was premiered and championed by DJ Edu on BBC 1Xtra, Afrohitsonthebeat on The BEAT 103.6 FM and DJ Neptizzle on Reprezent Radio. Ike released his second afrobeat single “Go Low” in March, 2016 followed by “I Dey Hail” featuring Nigerian hit maker Ycee in May 2016. From enjoying massive play on Nigeria stations like BEAT FM and COOL 96.9 FM , Ike took his foray into the Nigerian market with his own version of Olamide’s “Who You Epp" following that with “Philomena” which is a cover for Drake, Wizkid and Kyla"s “One Dance”. Both tracks have become a staple on the UK scene with dancers across social media Expressing their talents to “Philomena”. With continued support from DJs and radio personalities across the U.K, Ike Chuks got invited to the infamous BBC 1Xtra UK Afrobeat Cypher which he absolutely smashed with his Igbo lyrics. 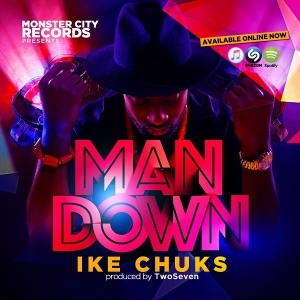 Fast forward to now and "Man Down” is the latest release from Ike Chuks. The heavy thumping party jam is Produced by TwoSeven (who has worked Tinie Tempah, Wizkid and DJ Drama). “Man Down” which simply means doing something incredible causing a reaction of shock and astonishment amongst others. Ike comes in flowing heavily in his beloved in Igbo language,follow him on Twitter/Instagram via @ikethekidd and on Snapchat via ike_thekidd. Listen, stream, buy, download and enjoy!